Finding a solution to the problem of raw sewage reclamation in rural Palestinian communities continues to be an ongoing issue. A new peace project between an Israeli treatment company Mapal Green Energy and the Palestinian Authority could sweeten tensions behind a stinky problem. When we covered a joint Israel-Palestinian project to tackle sewage problems in December, 2012 we reported that only 22.5 million cubic meters out of around 150 million cubic meters of raw sewage created every year is adequately treated to make it safe for reuse. The rest of this sewage was either stored in sewage lagoons and septic tanks, with resulting leakage into ground water aquifers; or allowed to flow directly into wadis or nearby streams . Green Prophet recently interviewed Avraham Israeli, Chairman of the Israeli Water Board, which is involved in a project to create a sewage water reclamation system for the West Bank Palestinian village of Uja, located near the city of Jericho. “We are starting with the small pilot project in Auja dealing with recycling domestic sewage and grey water for use in agriculture. We will later concentrate more on turning this water into that suitable for drinking,” he told Green Prophet. He added that small Palestinian towns and villages have a severe infrastructure problem – compared to cities like Nablus and Ramallah, which have some kind of municipal sewage system. Avraham Israeli told Green Prophet that they are trying to separate what they are doing from politics as it is felt that the use of advanced technology, as being introduced by water reclamation companies like Mapal Green Energy will benefit both the Israeli and Palestinian peoples. Israeli was involved in a special panel with delegates from both Jordan and the Palestinian Authority at the recent WATEC water event held last month in Tel Aviv: “Both the Jordanians and Palestinians were very impressed with the technology used by Mapal and other Israeli water companies; and we took them to see some projects now in operation in Israel,” he told me. Israeli adds that it is most important to show how technology can benefit people in their regions, with clean water being one of the best benefits. Mapal Green Energy’s CEO, Zeev Fisher, told Green Prophet that his company’s technology involves a system that has no moving parts and has surface floatation devices that result in creating less friction in the water, therefore saving as much as 70% energy use over other water reclamation systems. 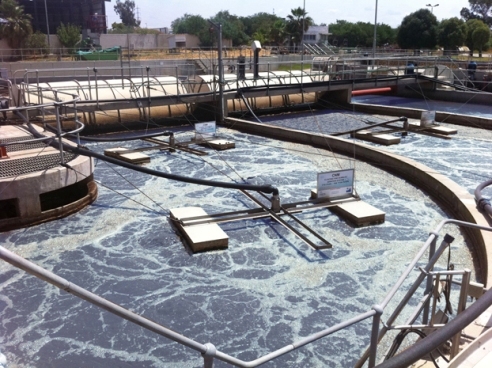 Fisher said that his company began operations in 2007; and since then has been involved in sewage water reclamation projects in Israel and various countries. Some of these countries include the UK, African countries like Angola, the Congo and South Africa, and South American countries like Brazil. Third: transfer of aerated water to a “polishing” lagoon that makes the water safe for agricultural use using the “good bacteria” to further clean the water. “The main problem in getting the sewage projects going in the West Bank is lack of funding. This is why we are starting with the small pilot project in Auja with the hope that more such projects will be approved for locations where they are most needed. “I am optimistic about the use of technology to solve issues involving cleaning sewage runoff and providing more water for agricultural and other uses,” says Water Board Chairman Israeli. QYResearch Ltd here. We’re a leading market research company based in China. We’re focus on the field of Industrial UPS and now we have newly published a report as , covering the recent five years of 2011-2016, which is very popular among the enterprises. The whole World should follow their example.